Route 66 is more than just a map or a strip of pavement. It lives on in the memories of those who have traveled or read about it. First came the dust bowl emigrants on their way to a better life in California, followed later by troop convoys heading to the battle fields, and then the weary soldiers wending their way back home. Soon there were tourists -thousands of tourists – traveling Route 66 on the vacation trip of a lifetime. 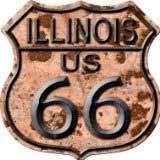 The spirit of Route 66 continues to live today for those who take the time to discover the mysteries of America’s most famous highway to adventure. The fascinating mixture of American history, nostalgia, and adventure brings travelers from all over the world to experience the romance of a simpler time, when life moved at a slower pace. No two experiences are ever quite the same. Whether you made the trip yesterday or more than 50 years ago, simply send us an email to shopcreativegifts@yahoo.com with your story along with permission to print it. If you have a photo of your trip, send it as well. It will be entered in our Memory Album along with only your first name and state or country. Take the time to send your memories in today.